Home Inside Webdefy Webdefy turns 4! 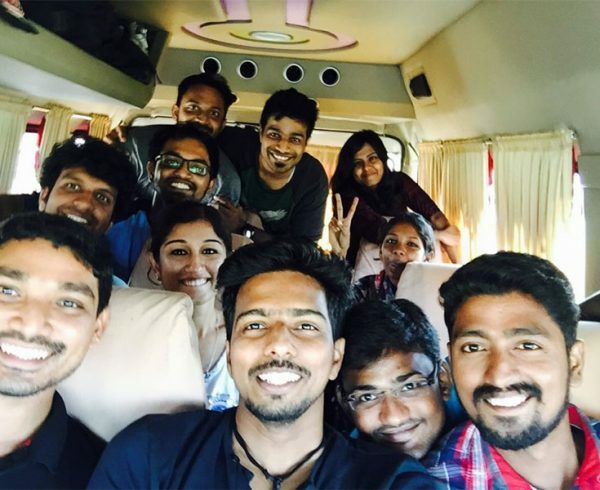 On the occasion of our fourth anniversary, we would like to look back into the journey of Webdefy. Every year, we’ve had new experiences, learnings and our reasons to celebrate every little success we’ve had. 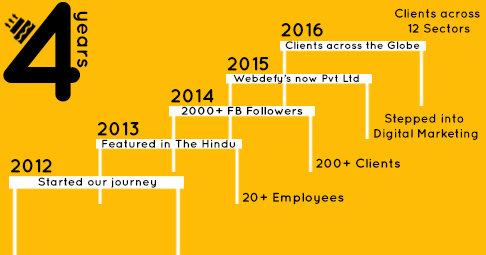 Let us walk you through the highlights of Webdefy’s journey from its baby steps to what we are today! Back in 2012 when Webdefy was just a baby in the minds of the Founders, a lot of support and encouragement came from KCG College of Technology. Being an entrepreneur is not easy. With a lot of support from family and friends, the founders of Webdefy brought it to life on May 2, 2012. A small group of friends who worked hard to make this company a success proved to the world that “ friends and business do mix”. Love and friendship are what kept us going. By the first anniversary of Webdefy, the we had successfully completed over 20 projects. The clients were more than happy with our work since a lot of emphases was give to quality. The Hindu recognised Webdefy for its young entrepreneurship spirit, quality of work and transparent pricing model and featured the company in an article on March 14, 2013. By May 2, 2014, when Webdefy celebrated its second anniversary, we had over 200+ clients; the company had worked for clients across the globe. We had more than 2000 followers on our Facebook page. On 4th of July 2014, Webdefy was incorporated as a Private Limited company. We are very fond of ‘Namma Madras’ and hence, we expressed our love for our city by conducting a campaign called ‘Madras 375’. Webdefy made it to ‘The Hindu’ a second time on May 10, 2015 ! We got featured for the Founders as one of those who ventured to start their own business right after graduating from college. Russel Nickson, one of our Founders, shared his experience and thoughts on what inspired him to get on this venture! In the same year, Webdefy set foot in a new vertical by designing the title and publicity designs for the movie “Iruvar Ondranaal” This was definitely a different accomplishment for us because it was a first time experience with the film industry! We celebrated 10000 LIKES on Facebook during our 4th year of operation and that was a huge milestone for us! Thanks to all our family, friends, supporters and followers, for all your love and support! It’s been a great ride for all of us, so far, with lots of memorable moments to be cherished. We are really glad to have crossed so many milestones throughout the last 4 years and we’re looking forward to an even more exciting road ahead!